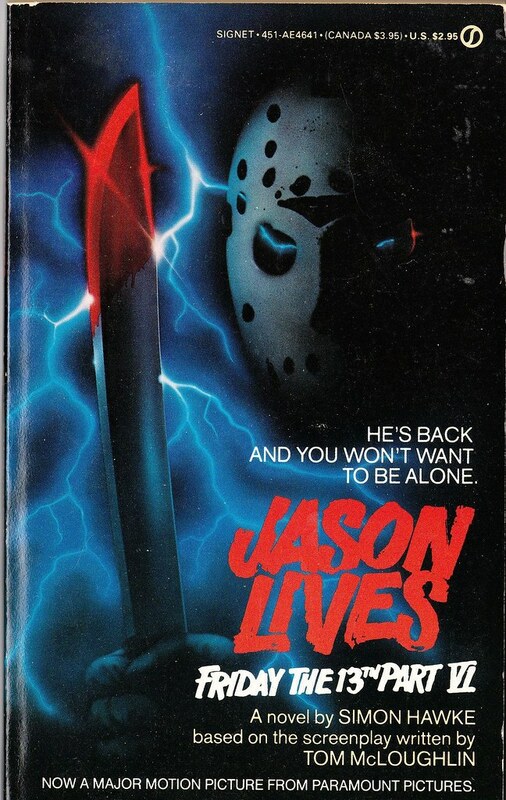 Today, we are going to look at a novelization for one of my favorite entries in the Friday the 13th franchise, Part VI: Jason Lives. This novelization was written by Simon Hawke and published during the original release of the movie in 1986. Hawke would go on to write novelizations of the first three Friday the 13th movies in 1987 and 1988. Hawke’s novelization of Part III would be the second novelization for that film. I reviewed both novelizations in yesterday’s article. And I don’t know about you, but that book cover is AWFUL. I don’t know why they didn’t just use the awesome poster for the movie. This would have been a much better book cover. This particular novelization, like many of the other F13 and Nightmare books, has become very hard to find. Again, I want to thank my friend Jason for loaning me them for the purpose of this review. This novelization is a very good adaptation of the movie. Not much new in so far as cut scenes. However, what Hawke does here that he would carry over into his novelizations of Parts I-III is to go into the heads of not only the main characters, but also Jason himself. There are many passages in which Jason questions his undying existence and wonders about his constant blood lust. It makes the story more interesting and adds an extra depth to the mute Jason. These inner monologues are used to fill in backstories for many of the other characters as well like Sheriff Garris and Tommy Jarvis. The only other thing that Hawke added to this book was a small tag scene at the end of the story that was supposed to be included in the movie. It takes place in the cemetery that once held Jason’s body (and his mother). We get a silent appearance by Jason’s father, Elias. This scene is setup in the beginning of the book when Tommy Jarvis questions why Jason wasn’t cremated like he was supposed to be. The sheriff off-handedly mentions that someone paid big bucks to buy the lots in the cemetery and have him buried instead. That someone, turns out to be Jason’s father, who is seen looking at his son’s gravestone at the end of the book. Like I said, this scene, from what I gather, was supposed to be included in the movie and the character of Elias would have been a presence in the next few movies. Unfortunately the studios ordered it removed. I like the idea of the shadowy Elias and having him show up in future movies would have been a nice touch. Plus, it makes you wonder about Jason’s dad. This appearance gives the impression that Elias is possibly aware of his son’s extraordinary existence. Does Elias hold more answers to Jason’s supernatural nature? We’ll probably never know. Anyway, like I said, if you like this movie, you’ll like this book. It fills in a lot of backstory to the characters, including Jason, and is a quick, fun read. I recommend it. 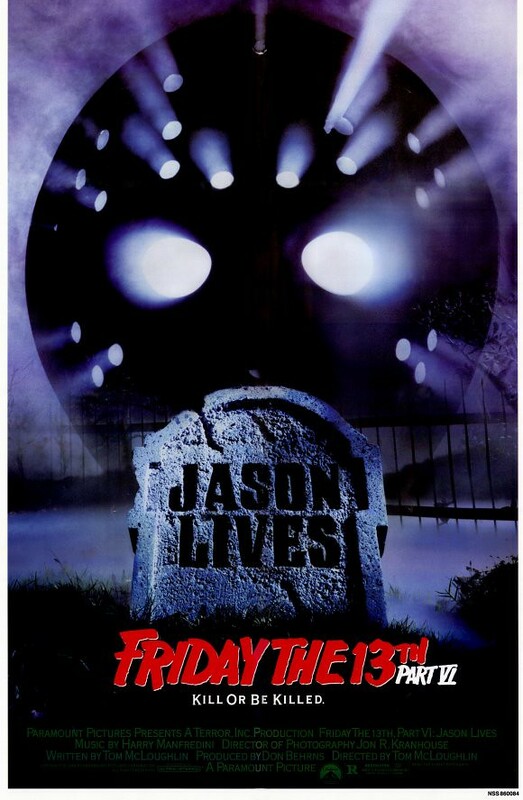 I mentioned this earlier, but I think Part VI has the best poster of all the F13 movies with the shadowy mask behind the “Jason Lives” gravestone. 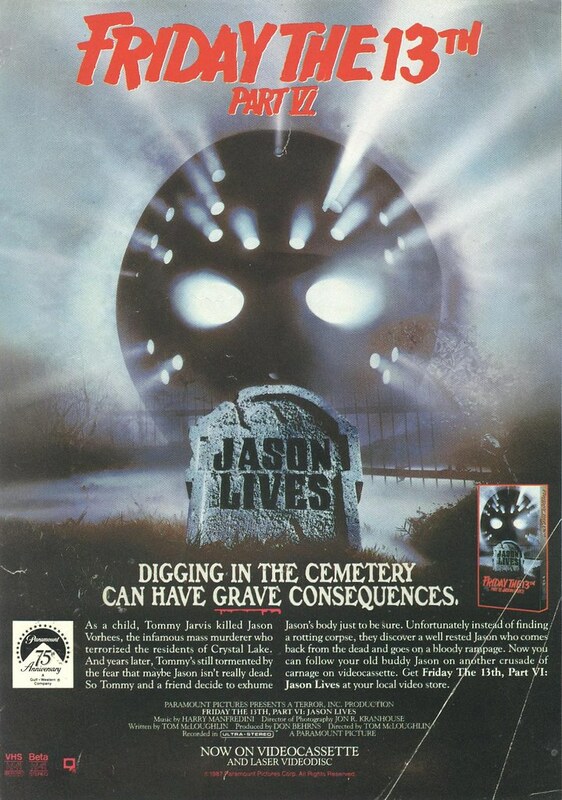 Check out the above full page magazine ad for the VHS/Laser Videodisc release of Jason Lives which uses the poster art. That art is tied with the banned I Love NY poster for Part VIII for best Jason poster. This entry was posted on October 10, 2012 at 8:45 am and is filed under books, Halloween, holiday, movies, pop culture with tags AWESOME-tober-fest, AWESOME-tober-fest 2012, Book Report, books, Friday the 13th, Halloween, holiday, Jason Voorhees, Movie Novelizations, movies, pop culture, reviews. You can follow any responses to this entry through the RSS 2.0 feed. You can skip to the end and leave a response. Pinging is currently not allowed. All this Elias talk has made me believe that the bounty hunter who sends Jason to hell in “the Final Friday,” should’ve been Jason’s Dad. They missed the chance to have one of those awesome, “I gave you life, son, and now I’ma take it back!” lines too.